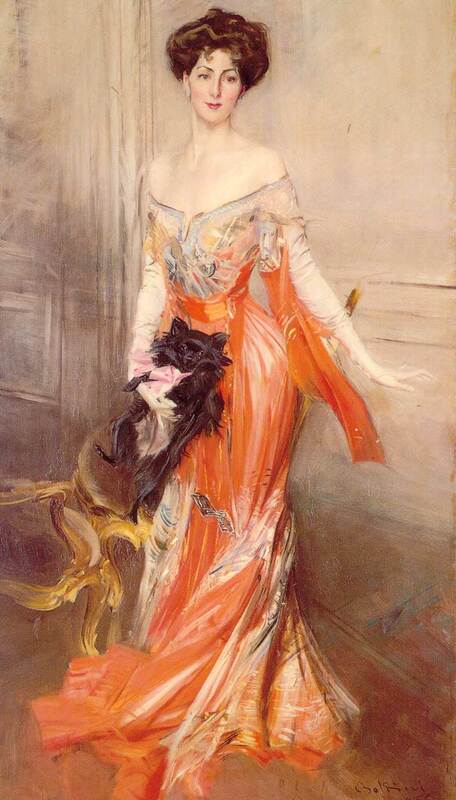 Giovanni Boldini, Portrait of Elizabeth Wharton Drexel (1905), oil on canvas, 219 x 120 cm, The Elms (Preservation Society of Newport), RI. WikiArt. 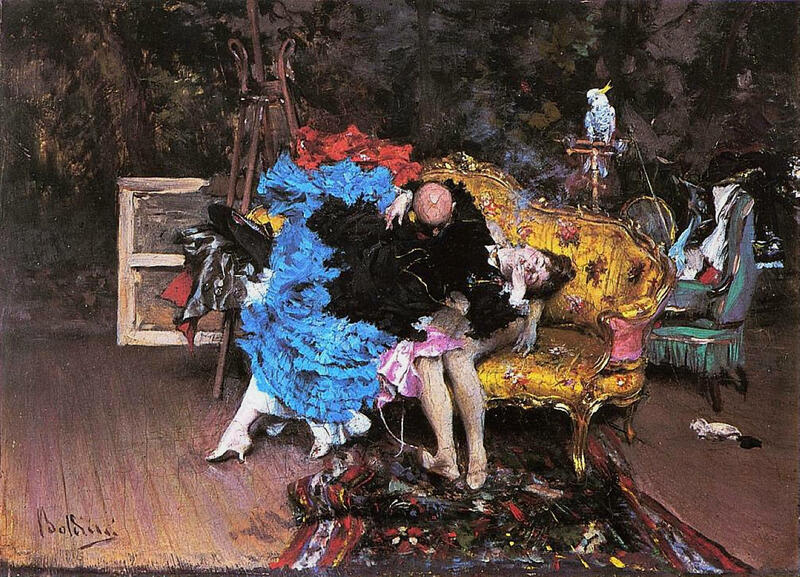 Boldini was brought up in Ferrara, where his father owned a restaurant and painted in his free time. 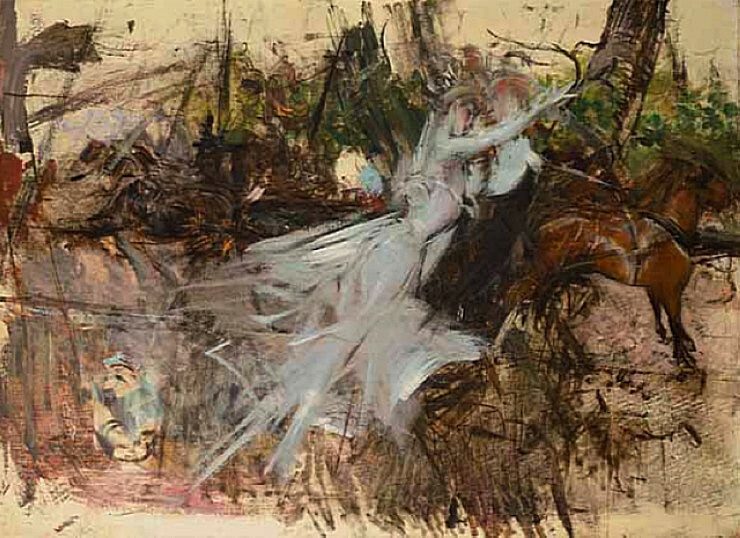 Today the town houses the largest collection of Giovanni Boldini’s work, in its Museo Giovanni Boldini, part of the Gallerie d’Arte Moderna e Contemporanea. 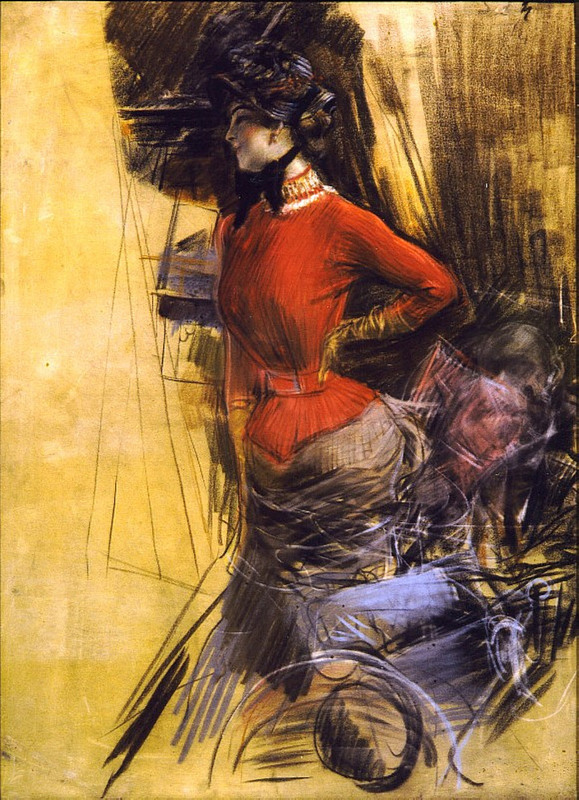 Boldini moved to Florence in 1862, where started his studies at the Academy of Fine Arts. He joined the Macchiaioli in 1864, meeting with them in the Caffè Michelangiolo in Florence. He was there most closely associated with Telemaco Signorini and Cristiano Banti, who became his mentor. Unlike most of the others in the group, he preferred portraiture, and painted well-known portraits of others in the group such as Martelli, Fattori, and Lionello. However he still completed some landscapes, at this stage mainly realist in style and of ‘studio finish’, as was usual among the Macchiaioli at that time. 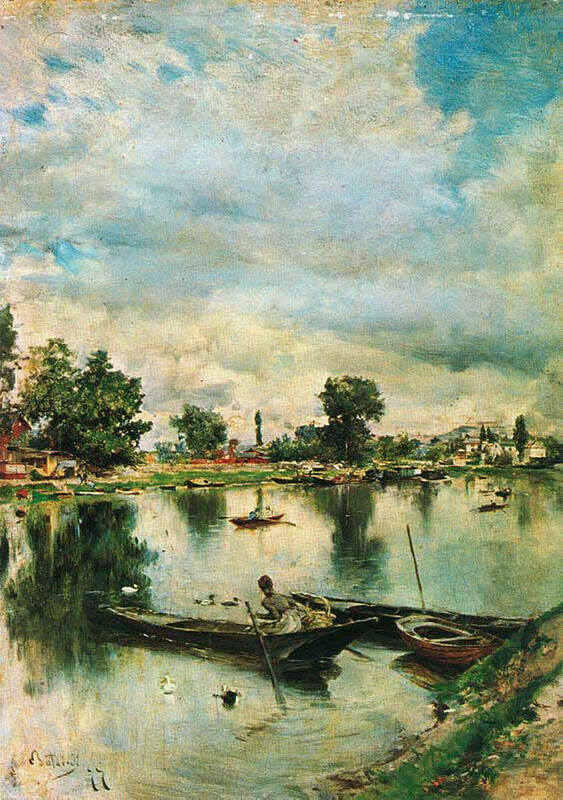 Giovanni Boldini, River Landscape, no further details known. WikiArt. Unlike the other Macchiaioli he seems to have had limited political involvement, and does not appear to have had any military career. The latter may have been due to his short stature: it is claimed that he was an inch too short to be accepted into any regular army. He travelled to Paris for the Universal Exposition of 1867, where he became influenced by the works of Courbet and Manet, and formed what was to prove a long-lasting and close friendship with Degas. 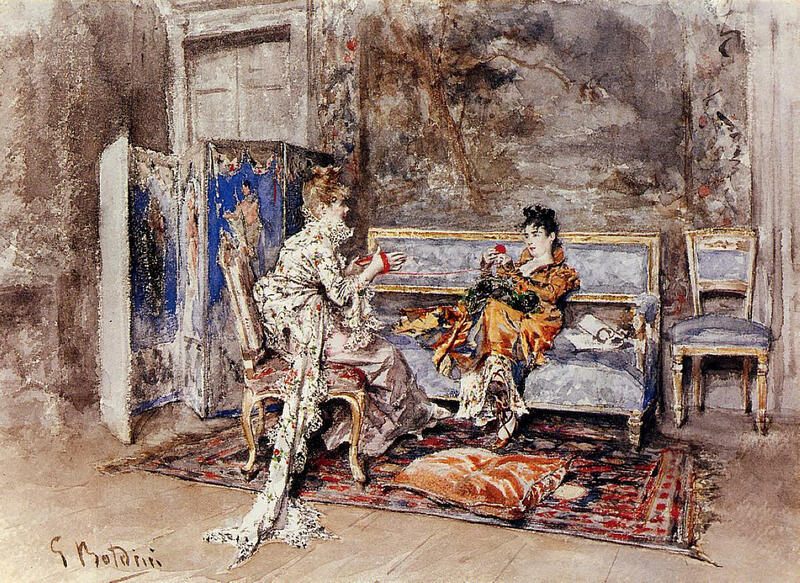 Giovanni Boldini, The Conversation (1870), watercolour on paper, Private collection. WikiArt. After a brief spell back in Italy mainly at Martelli’s estate near Castiglioncello, he moved to London in 1870, where his work impressed William Cornwallis-West, an affluent politician of influence. He started to build himself a reputation as a society portrait painter, which took him back to Paris in 1871. Giovanni Boldini, The Model and the Mannequin (1873), oil on panel, 12.7 x 17.8 cm Private collection. WikiArt. There he set up his studio in Montmartre, and developed his portraiture business. This was aided by a favourable contract with the major Paris art dealer Goupil. However he continued to paint works other than portraits, including several views of Paris. His style progressed from the rigorously realist and highly finished to become looser, and to appear more spontaneous if not sketchy. 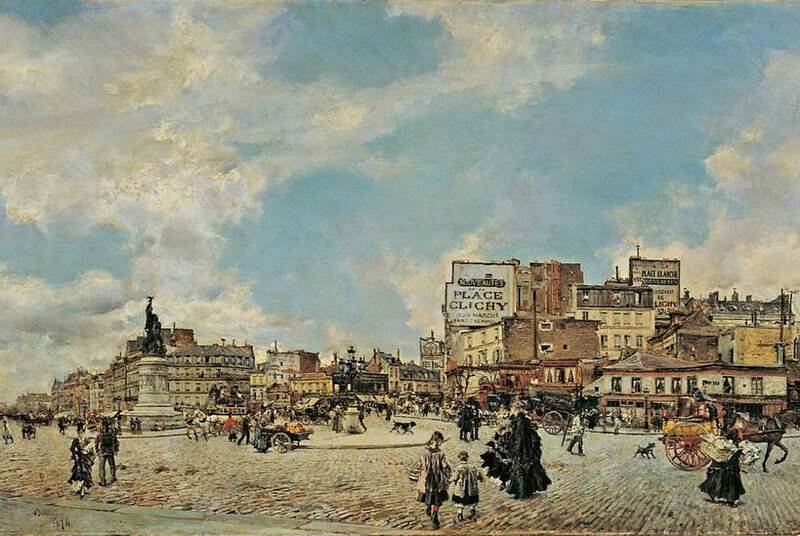 Giovanni Boldini, Place Clichy (1874), oil on panel, 60 x 98 cm, Private collection. WikiArt. This coincided with the extensive plein air campaigns by Impressionists such as Pissarro, Monet, Sisley, and Cézanne’s first Northern campaign, and the development of their high Impressionist styles. Giovanni Boldini, The Red Umbrella (1872-5), oil on canvas, Private collection. WikiArt. 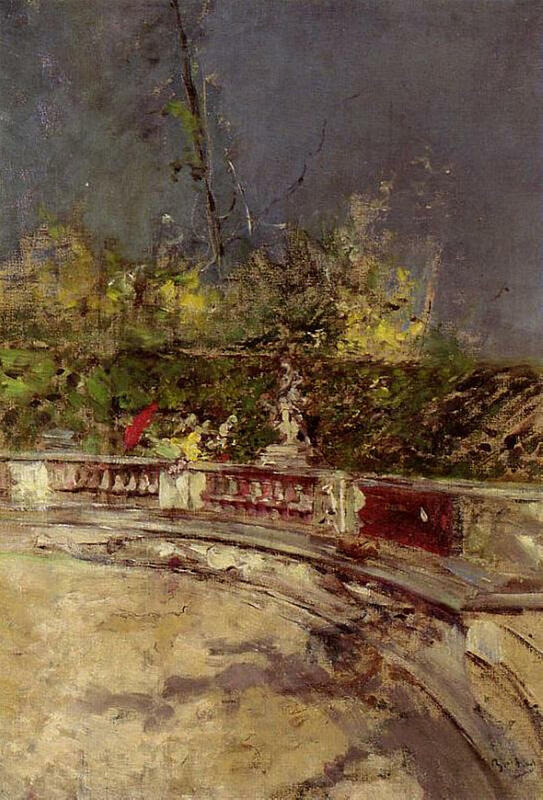 In 1876 Boldini abandoned his Macchiaioli style, and employed brighter colours with higher chroma, laid down using rapid bravura brushstrokes, leading to his later nickname of ‘the Master of Swish’. Subjects, particularly in his portraits, kept their smooth, lifelike appearance, often exaggerated in the vertical axis to flatter. His backgrounds and fabrics became rapid assemblies of sweeping curved brushstrokes, often petering out to leave areas of exposed ground towards the edge of the canvas. He kept in touch with former members of the Macchiaioli back in Italy, particularly Signorini and Banti his mentor. For the Universal Exposition in Paris of 1889, he was appointed the head of the Italian section. He also travelled to Madrid with Degas in that same year. Giovanni Boldini, The Mondona Singer (La cantante mondana) (c 1884), oil on canvas, 61 x 46 cm, Collezione Fondazione Carife, in deposito presso le Gallerie d’Arte Moderna e Contemporanea, Palazzo Massari, Ferrara. WikiArt. He made friends with John Singer Sargent, who was also pursuing a highly successful career as a portraitist outside of contemporary movements; he painted Singer’s portrait twice. Although superficially their portraits have some common style, and they may have influenced one another, their styles remained quite distinct and distinctive. 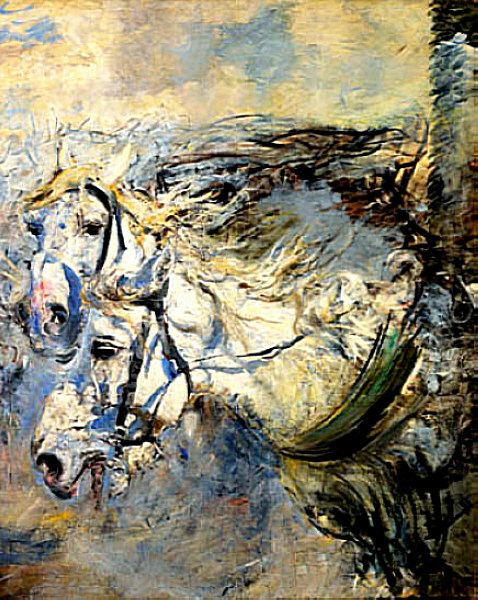 Giovanni Boldini, Two White Horses (c 1881–86), oil on canvas, 153 x 122.5 cm, Gallerie d’Arte Moderna e Contemporanea, Museo Giovanni Boldini, Ferrara. WikiArt. His paintings were introduced to the American market through an exhibition in the Wildenstein Gallery, New York, in 1897, which also organised his first retrospective exhibition in 1933, following his death. He painted a series of unconventional views of Venice, which contrast markedly with those of Sargent and Monet, who visited and painted there over the same period. 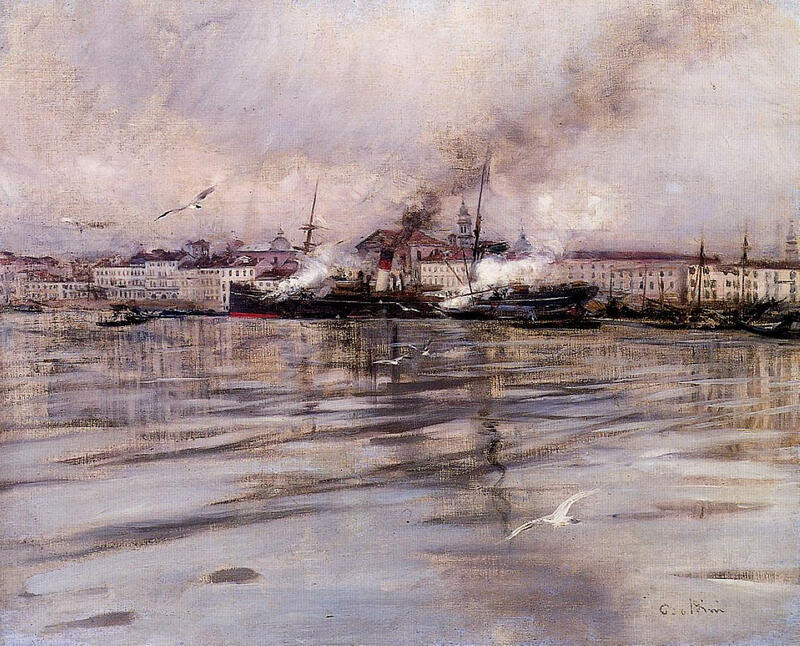 While the latter produced essays in light, water, and its classical buildings, Boldini captured the greys of water and smoke, perhaps reflecting his greater familiarity with the city in more everyday guise. Giovanni Boldini, A View of Venice (1895), oil on canvas, Private collection. WikiArt. Giovanni Boldini, A Midsummer Night’s Dream (1897), oil on canvas, 81 x 116.5 cm. WikiArt. His portraits remained very successful right up to the start of the First World War in 1914. 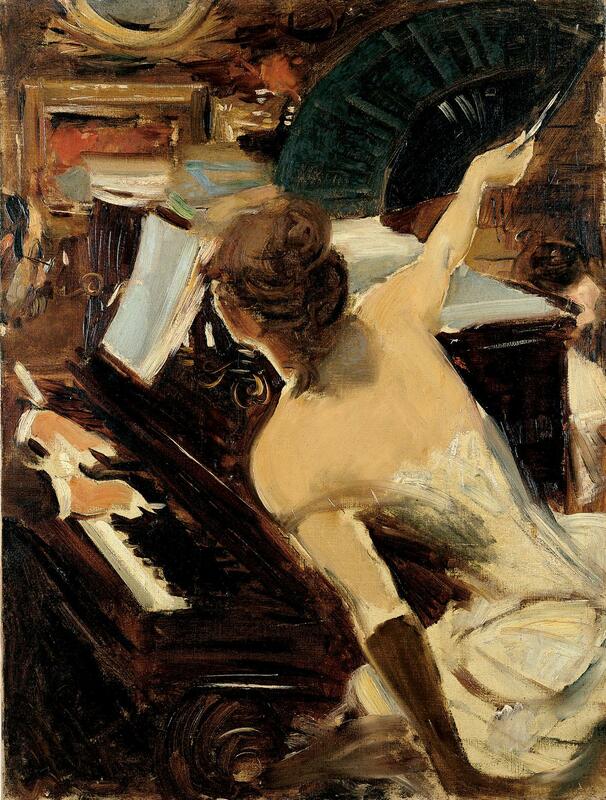 He painted many members of European high society of the day, including royalty and aristocracy, as well as Giuseppe Verdi the composer, Sarah Bernhardt the actress, and the painters James McNeill Whistler, Edgar Degas, Henri de Toulouse-Lautrec, and of course John Singer Sargent. 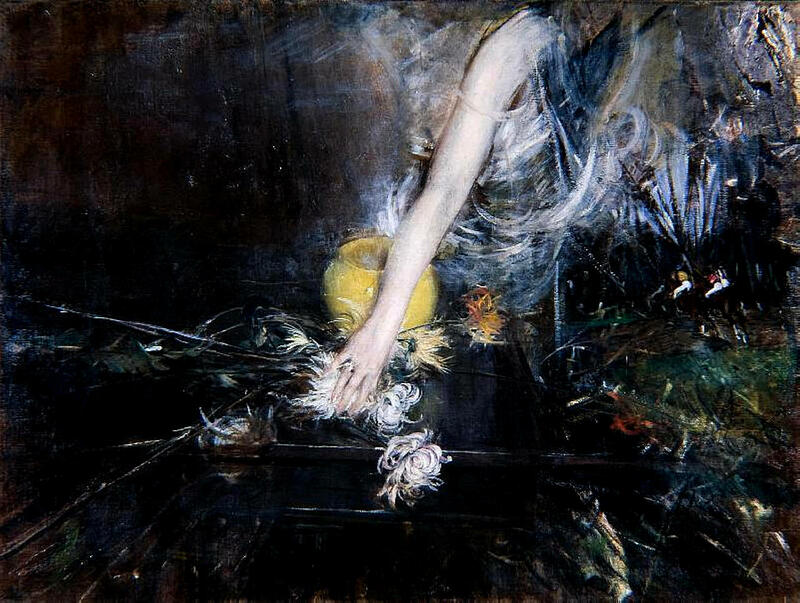 Giovanni Boldini, Arm with a Vase of Flowers (1910). WikiArt. He continued painting after the end of the First World War, almost to his death in 1931, and his motifs came to reflect the huge changes in art which were taking place during that period. After his death his paintings remained popular, and were praised in a 1933 article in Time magazine, coinciding with the exhibition at the Wildenstein Gallery in New York. 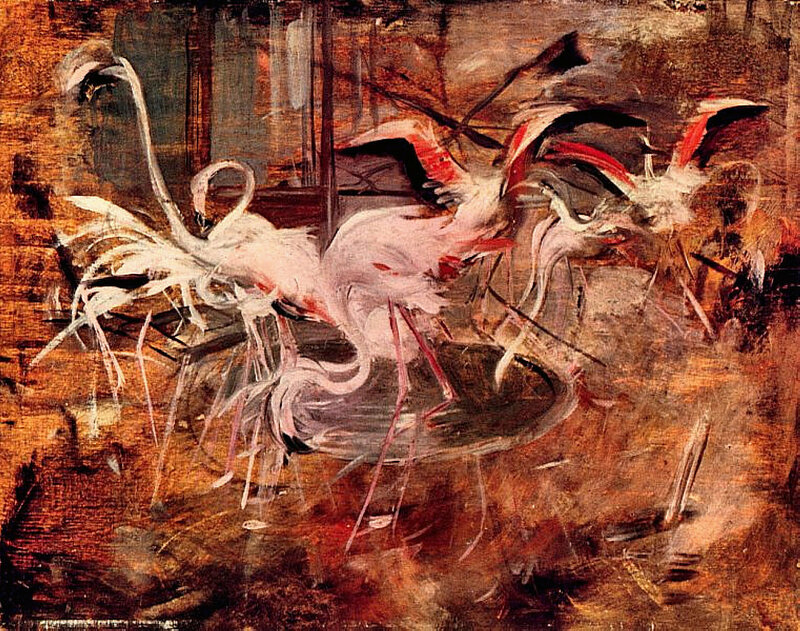 Giovanni Boldini, Ibis in the Palazzo Rosa at Vesinet (1910). WikiArt. Boldini was probably the most financially successful of all the Macchiaioli, as a result of his portrait work. Although he did paint fewer works of other genres, throughout his career he continued to paint occasional landscapes, city scenes, and other works. These became quite impressionist from the 1870s, and show influence from other movements later in his life. He does not appear to have had any significant influence on any of these movements, even the Macchiaioli, rather adapting his style in response to the lead of others. Apart from his early years as a somewhat atypical member of the Macchiaioli, he remained on the periphery of those other movements and kept his distinctive style as the Master of Swish. It is a great shame that his paintings are not seen more outside his native Ferrara. Posted in Painting and tagged Boldini, Courbet, Degas, Impressionism, Italy, Macchiaioli, Manet, Master of Swish, painting, portrait, Sargent, Venice. Bookmark the permalink.